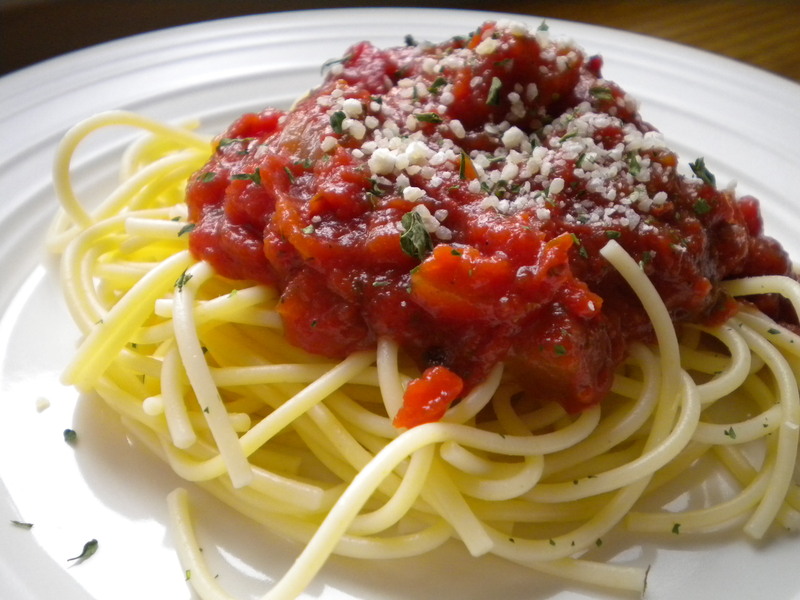 Simple Marinara Sauce – Voila! I really wanted to call this post ‘Killer Marinara,’ but I didn’t want to give the wrong impression about this sauce. It won’t kill you, but you will love it! I didn’t think a marinara sauce could be enough. I kept fretting over whether I should make a chicken parmesan or meatballs, but no, this marinara stands alone. Making your own sauce is so incredibly easy, if you’ve never tried it, you won’t believe it! So fresh, so delicious, so you-should-go-make-some-now! 1. Combine basil, rosemary, oregano and red pepper flakes in small bowl, set aside. Or use Italian Seasoning mix if available. 2. In large sauce pan heat 1 tablespoon olive oil over medium heat. Add onions and sautee until transluscent, about minutes. Add garlic and red peppers, if using. Sautee another 2-3 minutes. 3. Add tomato paste and flour until veggies are coated. 4. Add both cans of tomatoes and stir. Add 1 tsp. of italian seasoning mix. (If there is some left over keep around in case you need to add more later). Add parsley, bay leaves, brown sugar, and salt and pepper to taste. Stir well. Pingback: Happy New Year! « Voila! Pingback: Vegetarian Update « Voila! Pingback: Tofu Fried Rice and Vegetable Egg Rolls « Voila!